After years of being on the drawing board, the first commercial cellulosic ethanol plants are scheduled to start operation next year. Instead of using kernels of corn, they'll make the fuel from "biomass" -- corn stalks, wood chips and other low-value plant material. But just as the process is set to become a reality, some question whether it can fuel a viable business without considerable government support. 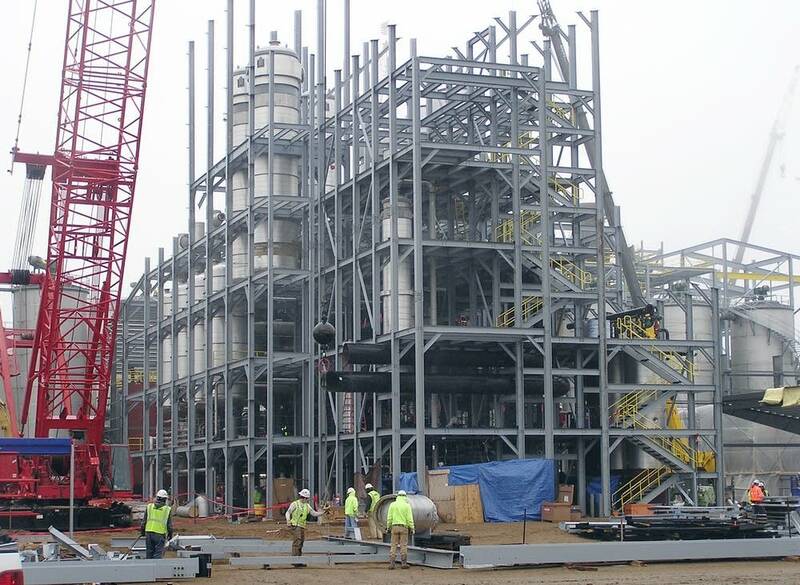 One of the first cellulosic ethanol plants is nearing completion just 30 miles south of the Minnesota border in northwest Iowa, where more than 300 construction workers are building a facility for POET-DSM Advanced Biofuels. "We're going to be running 770 tons of biomass through this facility every day," said Matt Merritt, public relations director for the company, headquartered in Sioux Falls, S.D. 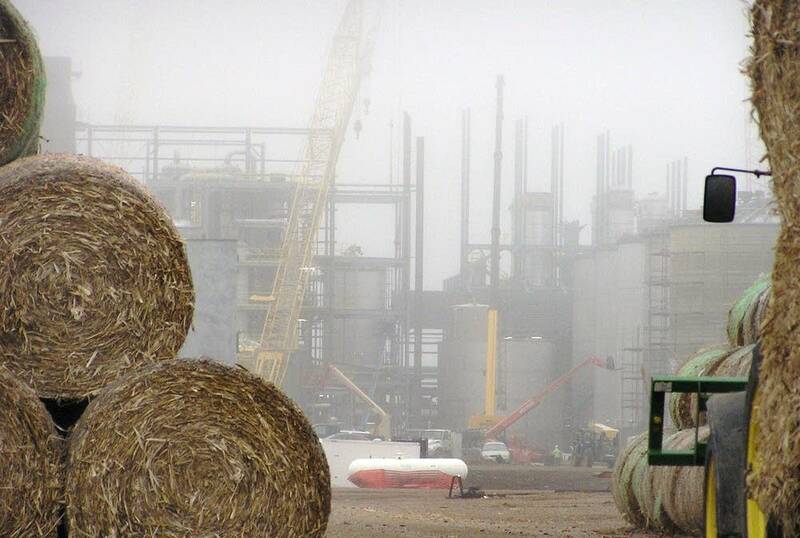 Much of the biomass from area farms already is stored near the plant in huge piles, ready to be turned into ethanol. It largely consists of six foot high round bales of corn stalks, husks and cobs. Merritt said the operation will extract sugar from the plant material, and then ferment the sugar into ethanol. For more than a decade, the company has been working on making cellulosic ethanol for commercial purposes. Since 2008, POET has produced ethanol at a pilot cellulosic plant, and last year it formed a partnership with DSM, a Dutch conglomerate. "DSM brings to the table a lot of money for one thing -- $150 million into the project," Merritt said. The plant in Emmetsburg is right next to a POET corn ethanol facility that has been operating for nine years. In the future the company may add cellulosic operations to its other ethanol plants, which include four in Minnesota, Merritt said. Elsewhere in the United States, at least two other companies -- Abengoa in Kansas and DuPont in Iowa -- also have cellulosic plants scheduled to open in 2014. But while it looks like a break-through year for the innovative fuel, there's still plenty of potential trouble ahead. "If the government pulls support, there won't be any cellulosic ethanol production in 10 years," said energy consultant Robert Rapier, chief technology officer for Merica International. That government support includes an $80 million federal grant for the POET-DSM plant in northwest Iowa. Rapier said it also includes the federal renewable fuel standard, which mandates how much ethanol fuel companies are required to blend into their gasoline. This year the standard called for just under 14 billion gallons of ethanol. But the Environmental Protection Agency wants to cut that back by about 10 percent for 2014. "All the ethanol producers are worried about that; they're even threatening to sue," Rapier said. "If you roll back the RFS you're going to destroy them." Leading the effort to reduce the renewable fuel standard is a coalition of groups that oppose the policy. Oil industry leaders say the standard is unrealistic because it requires more ethanol usage than there's demand for. Many livestock farmers don't like it because it's helped boost corn feed prices to record levels. Environmental organizations say ethanol-related demand for corn has prompted farmers to grow the grain on marginal land, like erosion-prone acres. Although ethanol supporters dispute any suggestion that the fuel harms engines, that also is a persistent claim. "These higher blends are poison to our marine engines," Nicole Payla Wood, government affairs program manager for BoatUS said at a recent EPA hearing. What bothers cellulosic ethanol companies about the proposed renewable fuel standard reduction is that it likely would cut into ethanol demand and reduce profits. That will have a spillover impact on the budding cellulosic industry, Merritt said. "Anything you do to hurt the profitability of the grain ethanol producers, is going to hinder their ability to invest in this new technology as well," he said. Merritt said POET-DSM is ready to sell its cellulosic technology to other ethanol producers. But he said if those operations aren't making money on their established corn-based fuel, it's not likely the owners will want to bet on the riskier new process.